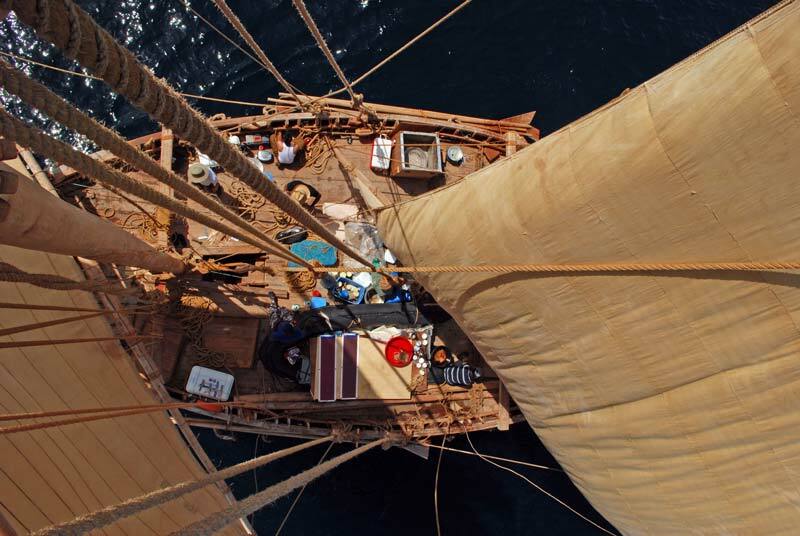 Jewel and her crew of 17 now settled down to the task of sailing the ship some 1,200 miles to Kochi in southern India. With no engine, the ship was entirely dependent on her sails which meant the crew, divided into two watches, had to be on hand day or night to make adjustments as the wind shifted. For weeks on end the crew coped with four hours on then four hours off. Living almost like 9th-century sailors, the crew faced tough conditions – no running water, no air conditioning and only a traditional charcoal fire to cook on. Below decks conditions were cramped and difficult. But morale among the crew was good as they made steady progress towards India. There were sightings of dolphins, turtles and even the occasional whale, as well as spectacular sunsets. Fridays were observed as days of rest with special meals prepared. And there was always plenty of work for the crew maintaining the ship, including making repairs to the mast, after strong winds made it necessary to fit reinforcing timbers.